put his slides on the city's website (not there yet). Meanwhile, pictures of them are in a LAKE flickr set. Hicks mentioned a USGS publication, Historic Flooding in South Georgia, March 27-April 3, 2009. He concluded that 0.03 percent (three hundredths of a percent) of the river water during the flood was sewer water, and the rest was flood storm water. During questions, Council Robert Yost took exception to the VDT's editorial assertion that the city let sewage from 80% of the city flow into the river. Henry Hicks asserted that was impossible, since the Withlacoochee Wastewater Treatment Plant serves only 67% of the city. Yost also asked for a presentation about the millions of dollars spent to improve stormwater management at Sugar Creek. Council Tim Carroll apologized for Henry Hicks having to spend so much time giving this presentation because of recent misinformation and thanked Hicks and his team for their recent work, plus police, engineering, etc. 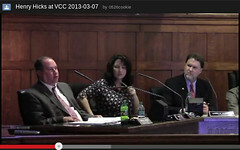 Carroll previously directly rebutted and added to what the VDT reported and answered a flooded citizen directly. Council Sonny Vickers discussed with Henry Hicks how it was necessary to take the WWTP offline during the flood so it could be brought back up quickly. (Somebody in the audience sitting near the camera didn't agree.) City Manager Larry Hanson said they'd discuss all that further at the City Council retreat next week. Obviously weren't aware we had so many qualified public utilities directors out in the community to speak on behalf of all the work that was done. She thanked all the city employees who helped. I didn't hear anyone mention wastewater all the way to the Gulf, and I suppose sinkholes are for another meeting. However, it was good to get a full presentation of the city's extensive efforts to deal with the wastewater problem.